March 22, 1913: Happy Birthday Tom McCall! 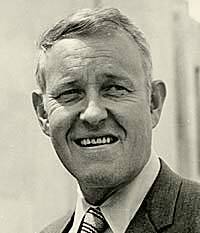 One of Oregon’s most celebrated governors, Tom McCall, was born on March 22, 1913 in Egypt, Massachusetts. He spent his childhood splitting time between the family ranch near Prineville, Oregon and his state of birth. After earning a journalism degree from the University of Oregon he worked at Moscow, Idaho’s News Review, before moving back to Oregon to work for The Oregonian, and then KGW as a radio news announcer. He served as a war correspondent for the Navy in World War II, and then returned to Portland and hosted a talk show on KEX. His political career began in 1949 when the Young Republican worked as an assistant to Governor Douglas McKay. In 1964 Tom McCall was elected secretary of state, and in 1966 he was elected governor. Notable legislation he supported during his two terms included the beach bill, providing for public ownership of Oregon’s beaches, and the bottle bill, requiring deposits on soda and beer bottles. Also under his administration urban grown boundaries were established. Governor McCall left office in 1975 and returned to broadcasting, working as a news analyst for KATU television. He died of cancer in 1983. Or if you do have to move in to live, don’t tell any of your neighbors where you are going.